What Should Be In Your Estate Plan? In general, an estate plan needs to do two things: determine what happens if you suffer a disability and plan for what happens after your death. 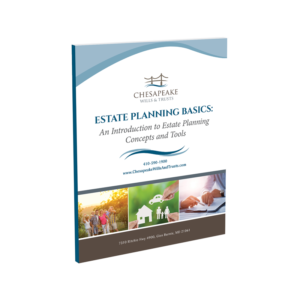 Several factors determine exactly what tools this requires and what should be in your estate plan. At Chesapeake Wills and Trusts, our estate planning team helps Maryland residents understand how they can ensure exactly what will happen to their assets when they can no longer control them. We can help you build a comprehensive estate plan that addresses all your family’s needs. Call us today at 410-590-1900 to learn more. On the surface, an estate plan is a legal mechanism that outlines what you want to happen to your stuff — from money to your house to your favorite collection — when you cannot control it anymore. Most frequently, we think about it as a way to distribute your assets after you die, but a proper estate plan also addresses what will happen if you are still alive but unable to make decisions on your own. These tools also allow you to attach certain rules, such as outlining exactly who decides whether you are no longer able to make these choices on your own. Your living will, in particular, also describes exactly what treatments you want and do not want used to sustain your life or whether you want emergency medical technicians or medical professionals to attempt to revive you if the situation calls for it. While people are often more familiar with wills, many clients we help chose to create trusts to help to keep their assets out of the probate process after their death. A trust allows you to choose not only who will receive your assets after your death, but when and how they can spend it, while you are alive and after your death. In addition to a will or trust, we can help you with specific needs unique to your family. For example, we can help you put a trust into place to ensure a loved one with special needs gets the financial support he or she needs after your death without jeopardizing his or her Medicaid or other government benefits. We can also help you put a plan in place to protect your home and nest egg if you need long-term care in a nursing home or other type of facility. We may be able to help you qualify for Medicaid sooner without having to spend down all the money you saved for your children and grandchildren’s futures. We understand it is not easy to consider or talk about your death or losing the ability to make your own decisions. Estate planning requires you to contemplate serious and devastating possibilities about your future. Our team can make this process easier, walking you through it step-by-step and offering advice and compassionate support while you make these decisions. While the process itself is not necessarily fun, it pays off when you have the peace of mind of knowing your future care and your family’s financial future is secure. By making the toughest decisions about your health care now, you take this weight off the shoulders of your loved ones. At the same time, you can help them avoid the headache of the probate process and give them almost immediate access to your assets after your death. The team from Chesapeake Wills and Trusts can help you create a Maryland estate plan that meets your family’s unique needs. We can help you put a plan in place for what will happen if you suffer an incapacitating illness or injury, and what happens to your assets and your family’s financial future after your death. Call us today at 410-590-1900 to learn more or get started today.